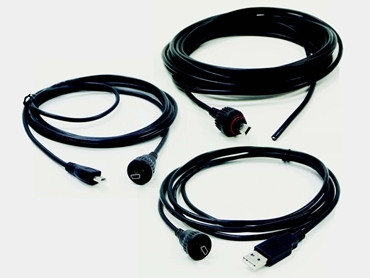 Clarke & Severn Electronics introduces the latest range of sealed mini USB cables by Conxall. The sealed mini USB cable assemblies are Conxall’s latest addition to the Data-Con-X family of products and are ideal for sealed data transmission, military, GPS and medical applications. Sealed to IP67 and IP68 NEMA 250 (6P) when mated, Conxall mini USB cables have three different standard cable assembly options (sealed mini-USB to standard USB, to mini-USB or to blunt cut). Key benefits of the sealed mini USB cables include ease of assembly, quick connect bayonet style interface, compact design housed in the Mini-Con-X housing and RoHS compliance.